KUCHING: Sarawak education hopes to tap into the kind of revolutionary change experienced by manufacturing and construction sectors following beneficial partnerships with China. Tiong (fifth left) exchanges documents with Hua (fifth right) while Len (centre) looks on. Assistant Minister of Urban Planning, Land Administration and Environment, Datu Len Talif Salleh said Sarawak has much to offer, and could play an important role. “China remains a key trading partner and a major source of foreign direct investment (FDI) for Sarawak and Malaysia,” he said during the signing of memorandum of understanding (MoU) between I-Systems Group of Colleges, Geely University Beijing, Chengdu Dream Space Technology Co Ltd, and Tabung Ekonomi Gagasan Anak Bumiputera Sarawak (Tegas) at the premises of I-Systems Group of Colleges here yesterday. “I believe the partnership can become a platform for the exchange of expertise and experiences between them, thus, elevating the quality of our local graduates,” he added. Len said Chengdu Dream Space Technology Co Ltd turned from a ‘ghost town’ into a state-of-the-art incubator that attracted thousands of projects and start-ups, creating great opportunity for the people. “Many Sarawakians are working overseas producing new apps. They are successful in Singapore, Australia and Canada. I believe that through the partnership between I-Systems Group and Chengdu Dream Space Technology, and supported by Tegas initiative, we will be able to co-create the ecosystem where the young and talented minds can become more innovative, capable of inventing new processes and apps, to benefit Sarawak.” I-Systems Group of Colleges will work with Chengdu Dream Space Technology Co Ltd in providing entrepreneurial and innovative training in Kuching to nurture and enhance innovative talent and entrepreneurship among local youths. Meanwhile, the partnership with Beijing Geely University is expected to produce world-class workforce, exposing students to the best practices in the industry. “The university has become the strategic partner of Malaysia’s DRB-Hicom, which brings Proton cars into the Geely family. Under this agreement, we hope that Proton will be the number one Malaysian domestic brand and a leading brand in South East Asia,” Len said. Geely, which already owns Volvo and Lotus cars, recently acquired nearly 10 per cent of Mercedez-Benz, making them the largest shareholder in Daimler. Len said this development is beneficial as the automotive industry is changing fast, requiring new advancement in how they train workers. Under this joint agreement between I-Systems Group of Colleges and Geely University Beijing, students can enjoy the sharing of expertise, information dissemination, and student exchange programmes. During the ceremony, Len and other guests also unveiled the new signboard at the venue for the Internship Centre of Beijing Geely University, China and I-Systems Group of Colleges, Malaysia. All these collaborative efforts will lead to the ultimate goal of setting up Geely Malaysia University in Kuching. 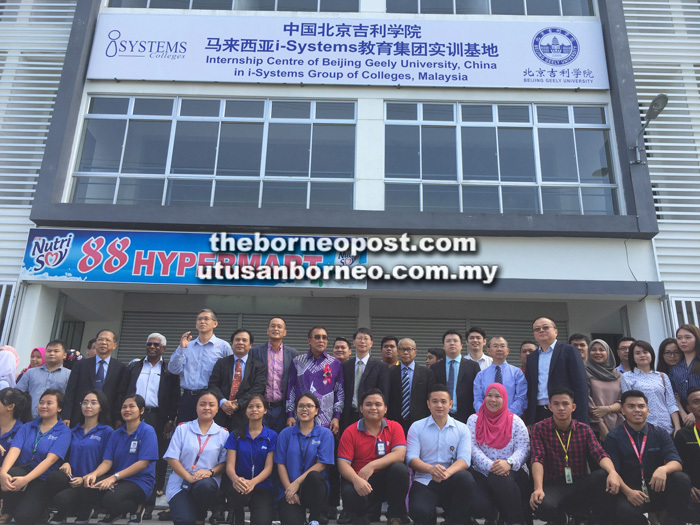 Signing on behalf of I-Systems Group of Colleges was their corporate chief executive officer Dato John Tiong. The other signatories were Chengdu Dream Space Technology Co Ltd chairman Pan Xi Hong, Beijing Geely University president Hua Wei Dong, and Tegas chief operational officer Awangku Merali Pengiran Mohamed. In his speech, Tiong said to foster economic growth and job creation in Sarawak, more entrepreneurs were needed. Len (standing seventh left) with students and other guests pose for a group photo in front of the newly unveiled signboard for the Internship Centre of Beijing Geely University, China and I-Systems Group of Colleges, Malaysia. Assistant Minister of Transportation Datuk Dr Jerip Susil, China’s deputy consul-general in Kuching Zheng Yang, Beijing Geely University International Exchange and Corporation Department director and dean Professor Kuang Song, regional general manager of Bank of China (East Malaysia) Zhang Hongkun, I-Systems Group of Colleges Company director Ling Chong Seng, and deputy permanent secretary to the Ministry of Education, Science and Technological Research Dr Abdul Rahman Deen were among those present at the signing ceremony.